*Editor&apos;s note: This is the first blog post by our new visitRaleigh Foodie Blogger, Kristen. To find out more about her, read her bio, here. After successfully walking across the stage without falling on my face and making a corny graduation speech, I was done with graduate school. 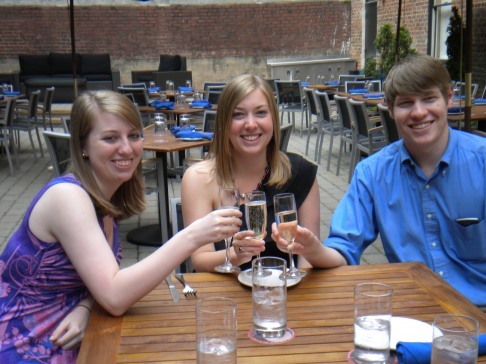 To celebrate, my family and I went to Sitti Restaurant in downtown Raleigh and were seated outside on their patio. The lighting, modern furniture, and brick walls make you feel like you’re at an upscale restaurant in NYC. We couldn’t have asked for a better table to celebrate graduation. I crave Sitti’s warm pita bread. Whatever Sitti puts in their pita bread, it works. I can’t stop coming back to this restaurant for the house baked pita bread, which you receive as soon as you sit down. The warm pita dipped in the za’atar is incredible. Before your meal comes it’s very likely you’ll eat at least two (maybe three) pieces of pita. We also tried the halloumi, which my dad likes to call the “Lebanese grilled cheese sandwich.” This Mediterranean cheese is seared and then topped with dates, roasted almonds, olive oil and fresh thyme. The sweet taste of the dates paired with the rich taste of the cheese is wonderful. My younger sister is usually not an adventurous eater. One of the employees, Eryk brought us out Sitti’s sweet potato kibbee mikli, an appetizer in the running for the Best Dish in N.C. competition. The crust is made out of sweet potatoes from Pine Knot Farms and inside is Ashley Farm’s chicken hashwi. My sister said this was the best thing she’s ever eaten in the entire world. It was slightly fried, the perfect mixture of sweet and savory, and when dipped in the labneh (a Lebanese yogurt) it was even more delicious! After eating too much pita and all the appetizers, can you believe we were actually able to eat dinner? 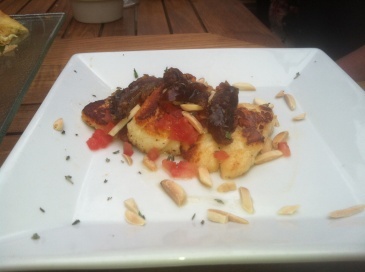 I tried Sitti’s entree, which is also in the running for the Best Dish in NC competition. I ate the softshell crab with sweet potatoes and mustard greens. Oh my goodness! I ate the whole crab, which was extra crispy. The sweet potatoes were tender and I especially loved the brilliant purple and orange colors. The mustard greens were phenomenal and added a savory flavor to the dish, which complemented the crab. After eating entirely too much food, it was time for an adventure. 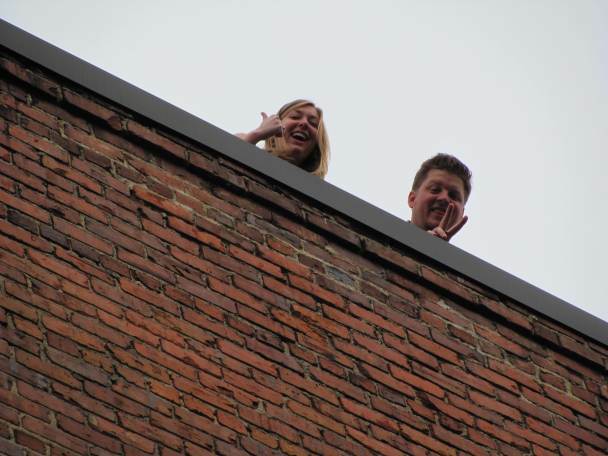 Eryk took me up to the roof to see the Sitti bees. The honey bees collect their pollen from either the Capitol Building or Moore Square and then return to one of the four hives on the roof. Within the next month or two Sitti will be making their own honey, Hargett Street Honey. They will use the honey in their food; you can’t get more local than that! Sitti is such a wonderful restaurant and I would highly suggest visiting for fresh, authentic Lebanese food.